According to Gartner’s hype cycle of emerging technologies, 2017; Deep Learning and Machine Learning have reached the peak of inflated expectations. Artificial General Intelligence (AGI) and Deep Reinforcement Learning are in the phase of innovation trigger. We are in 2018. The sentiment over Artificial Intelligence (AI) is euphoric. Every technology firm is jumping on the AI first bandwagon. Companies like Google, Microsoft, Amazon, and Alibaba are pushing the frontiers. There are a plethora of smaller players that are doing cutting-edge work in a niche area. AI is permeating into everyday lives. Firstly, let’s get the context of AI correct. A data scientist spends a lot of time in understanding the data. A data scientist tries to fit multiple models. They try out multiple algorithms to find the best model fitment that provides the optimal result. 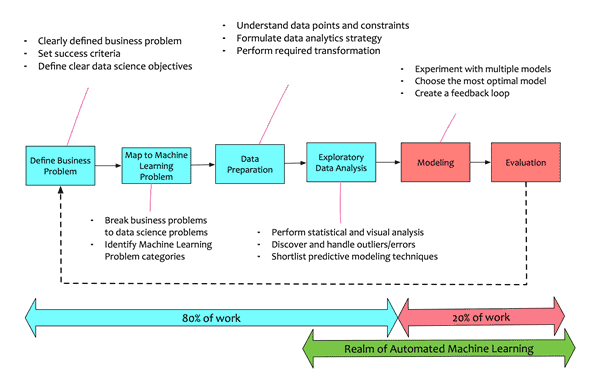 Automated machine learning attempts to automate the process of performing exploratory analysis. It tries to automate the process of finding hidden patterns. It automates the training of multiple algorithms. In short, automated machine learning saves a lot of data scientist time. Data scientist spends lesser time in spending on model building and more time on evaluation. Automated machine learning is also a blessing for non-data scientists. It helps them to build decent machine learning models without deep-diving into the mathematics of data science. In 2018, I see that this trend will become mainstream. Google recently launched AutoML in their cloud computing platform. There are niche companies like Data Robot who specialise in this area and are becoming mainstream. Machine learning is a lot about data. It is the process of storing data. It is a process of analyzing data, training models and evaluating them. It is a data and compute-intensive process. It is iterative with hits and misses. 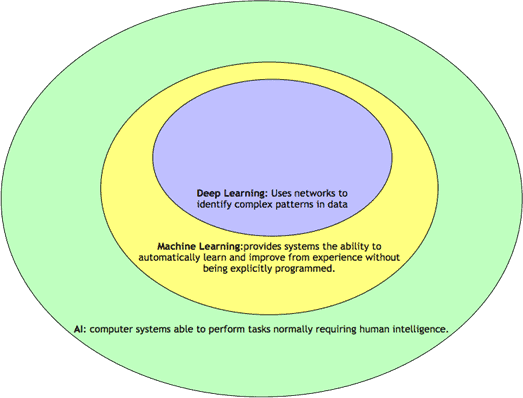 Cloud computing provides an ideal platform where machine learning thrives. Cloud computing is not a new concept. Traditional cloud offerings were limited to Infrastructure as a Service (IaaS). Over the past few years, public cloud providers have started offering Machine Learning as a Service. All the big cloud providers have a competitive offering in Machine Learning as a Service. I see this trend continuing to increase in 2018. The cost of computing and storage in the cloud is lower and on-demand. The costs are controllable. The cloud providers provide out-of-the-box solutions. Data scientist now can spin up analytical sandboxes in the cloud, perform the analysis, experiment with a model and shut it down. They can automate the process as well.Machine learning in the cloud makes the life of a data scientist easier. Deep learning is a subset of machine learning that utilizes neural network-based algorithms for machine learning tasks. Deep learning methods have proven to be very useful in the field of computer vision, natural language processing, and speech recognition. The sheer amount of data required to train deep neural networks. These reasons cease to exist now. There is data now. There is abundant computing process available. The research in deep learning has never been so ebullient as compared to the past. Increasingly, deep learning is powering the fruition of complex use cases. Deep learning’s application ranges from workplace safety to smart cities to image recognition and online-offline shopping. This trend will continue in 2018. In 2017, data science community avidly followed the debate between Elon Musk and Mark Zuckerberg. The topic of the debate: Should we fear the rise of AI? Elon Musk had a pessimistic view on the topic. His views: the rise of AI has imminent dangers for humanity. On the other hand, Mark Zuckerberg, had a much more optimistic outlook on the topic. His views: AI would benefit humans. This debate between these tech tycoons, has everyone thinking about AI and its regulation. In Jan 2018, Microsoft chimed in saying that AI needs to be regulated before it’s too late. There is no easy answer to this question. AI is still an evolving field. Excessive regulations have always stifled innovation. Maintaining a delicate balance is crucial. The regulation of AI is an uncharted territory with technical, legal and even ethical undertones. This is a healthy discussion point. “Should AI be regulated? This will be a key discussion point in 2018. Pradeep Menon is a seasoned Data Science professional. He has more than 15 years of experience in the field of Data Analytics. He is a hands-on technical expert with a proven track record of helping organizations to transform. Pradeep can balance business and technical aspects of engagement and cross-pollinate complex concepts across many industries and scenarios. He is a distinguished speaker and blogger and has given various talks on the topics on Big Data and AI. Currently, he works as a Director of Big Data and AI Solutions with Alibaba Cloud. In this role, he consults his clients to be more data-driven and achieve success by the practical application of Big Data and AI technologies.